I used to find that once you broke the ice and let kids see what was possible (assuming a good positive approach) the kids really blossomed into real martial artists. Conversely if the instructor made it too hard with discipline for mistakes and such – only a few kids would stick through it. So I think it is so important that parents find a good fit for their kids… not so much the instructors pedigree but more if the kids like the instructor and school – is most important. Left a comment before – don’t know what happened to it but I think the instructor is so important when selecting a school. 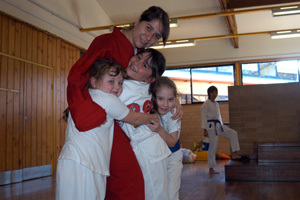 Good instructor – the students will feel good and keep coming back. Hi John, sorry wordpress is supposed to allow your comments without moderation because you have been approved previously. Not sure why it got caught in the spam catcher. Yes, many instructors just make it too hard for kids–they treat them like mini-adults, then wonder why none of them stick around. It is so important to pick a good instructor because a poor one can leave a bad taste in the students mouth and turn them away from the martial arts permanently.